I've followed/looked at several guides (like this one) on how to do the above. several times. I've also rebooted the PC and still no luck. I am sure the ethernet port works as I was previously using it on Ubuntu 16.04 just before I decided to fresh install 18.04.2. Any ideas what I could be doing wrong? I am going to use the ethernet port to connect my main PC to the Ubuntu server via a crossover cable. and connect an ethernet cable from it to my modem/router and disable my WiFi card (by removing the netplan config), the PC can connect to the net without any issues. which also shows the contents of my YAML files. I have tried with and without dhcp4/dchp6/gateway4/renderer. 1. Go to /etc/netplan/ directory in your server. 3. 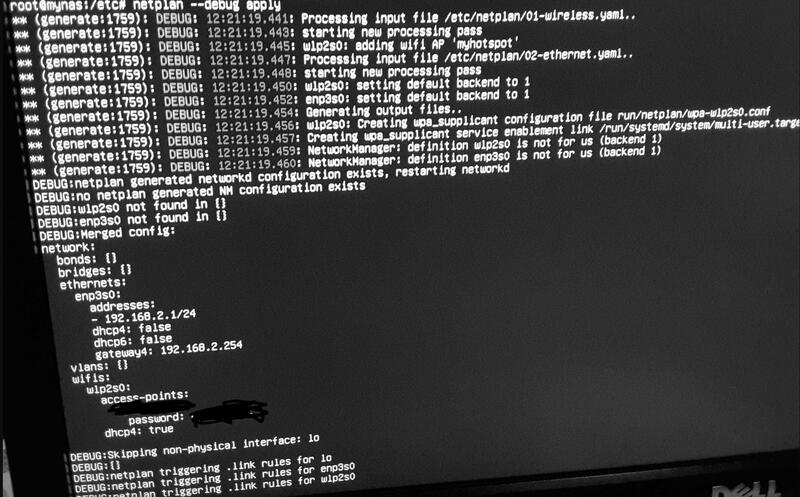 Now, you have to run “sudo netplan apply” command. 4. If there is an issue, you can run “sudo netplan –debug apply” command. Last edited by krishan25; 03-17-2019 at 07:27 AM. My netplan config for reference. Spacing is very important. Do not use tabs. This is configured to use itself for dns. A bridge would be similar. No point having the bonds, bridges, vlans tags if you aren't using them. They just are more potential problems that you need to isolate as not being the issue. Last edited by jmgibson1981; 03-19-2019 at 07:59 PM. Good info to know here!! !